Your Billing and Shipping address MUST match on all high value orders. Your order will be cancelled if they do not match. Free Standard Shipping (for qualifying orders): Typically delivered in 7-10 business days. An order qualifies for free shipping when the cart total exceeds the established minimum value for qualified products. Some products that are bulky, heavy, or large do not qualify for free shipping and therefore will not count towards your free shipping required value. $7.95 Flat Rate Economy Shipping: Typically delivered in 5-8 business days. UPS Ground (1-5 Business Days): Recommended for items over 3 lbs. shipping weight or bulky items. Depending on your zone, UPS can be faster than USPS Priority Mail and less expensive. UPS Overnight Air (1 Business Day): Expensive, but gets there overnight. UPS doesn't count the day the item was shipped (picked up), Weekends or Holidays as delivery or transit days. Example: A 2nd Day Air Package ordered after 2 pm MST on a Wednesday will be shipped on Thursday and will not be delivered until Monday. We reserve the right to change shipping methods if the address verification do not match shipper's address database or if we choose to upgrade methods due to specific or unusual circumstances. Example: You enter a Post Office Box shipping address, and you choose UPS (United Parcel Service) shipping, we may change to USPS (United States Post Office) and ship to your post office box address. Please Note: UPS doesn't count Weekends or Holidays as delivery days. Products ordered normally get shipped the next business day. 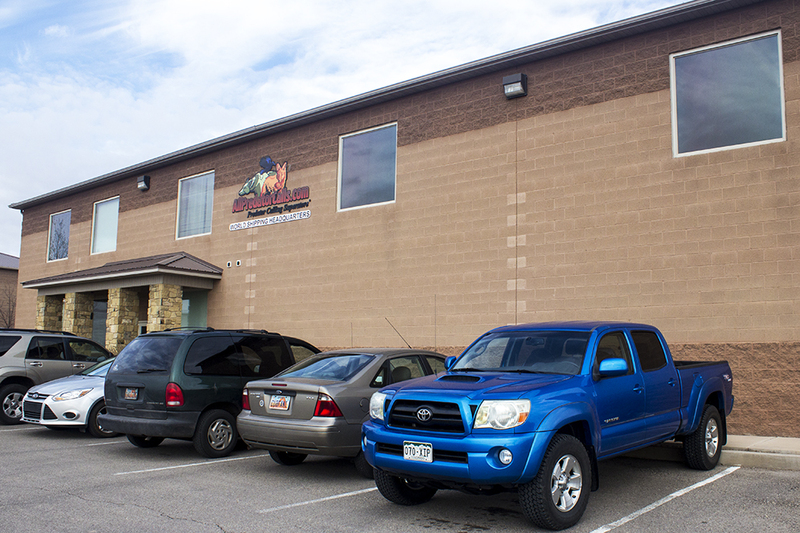 100 percent of the items we sell on AllPredatorCalls.com are stocked at our large and modern St George, Utah shipping facility (pictured right). We do not "drop ship" from other companies, we stock everything we sell. We update our out of stock status several times each day (online). If you can add it to your online shopping cart - It's IN STOCK. We do not control UPS or US Postal Service or their delivery schedules - Severe weather, road closures, aircraft delays, incomplete address, acts of god, etc can all affect delivery schedules. Many rural areas still take 2 days delivery time even with Express Mail. We will not refund shipping charges for UPS or the US Postal Service not meeting there delivery time guidelines. WE DO NOT REFUND SHIPPING CHARGES ONCE AN ITEM IS SHIPPED.